Last fall, our project manager, Chester, completed this kitchen remodel for our clients, Rodney and Gena. They had a small, enclosed kitchen and wanted to open up two walls: one to the dining area and one to the living room. Even though we didn’t move any major appliances or plumbing, it is one of our more significant transformations! They chose white custom cabinets which Buck built in our local cabinet shop (for more information on our custom cabinetry, click here!) A white farmhouse sink, steel gray granite counter tops, stone back splash with a green quartzite mosaic strip, vinyl plank flooring, and new appliances completed their design. We removed the furdown (area of drywall above the cabinets) and relocated the AC duct to the ceiling. This allowed us to make their new upper cabinets ceiling height. We removed the entire wall between the dining area and kitchen to make it one seamless space. We also removed the entire wall from the kitchen to the living room. We created a peninsula with a bar to the right of the refrigerator overlooking the living room. We love Rodney and Gena’s design and the finishes they chose. The oak vinyl flooring and mixed back splash add texture and character, while the white cabinets, stainless steel appliances, and new recessed lighting keep the design simple and bright. And now, with ceiling height cabinets and both walls removed, the entire space feels much larger without adjusting the footprint at all! Thank you to Rodney and Gena, for being such a pleasure to work with, and for trusting us with your home. Our wonderful clients, Angie & Erin, had us remodel both their kitchen and one of their bathrooms in one fell swoop! They were a delight to work with, and we love how their new kitchen and bathroom turned out. We kept the same layout in the kitchen, but updated everything. We built new custom cabinets, installed granite counters with a leather finish, tile back splash, a new vent hood and cook top, and wood-look tile flooring throughout the kitchen, dining, and living areas. The white cabinets, gray counters, and subtle back splash make the kitchen feel so much brighter than before. Removing the upper cabinets and creating a flat counter space around the sink significantly opens up their galley kitchen to the living room. On the sink side, we included a trash can pull out and installed a new dishwasher. A larger cabinet was built above the refrigerator to partly make up for the lost storage when we removed the upper cabinets. We also built a custom wine rack to make use of the empty wall space to the right of the refrigerator. A closer look at the cabinetry detail. On the opposite side of the kitchen, we replaced the vent hood and cook top. We also included two sets of drawer banks in the lower cabinets. We installed new recessed lighting on the ceiling to replace the large rectangular fluorescent light. We love the way their new wood look tile flows all throughout the downstairs living areas. For their upstairs bathroom, we also kept the same layout, and gave everything an update. We built a new vanity and replaced the doors on the linen closet to match, installed the same granite counter and wood-look tile floor as in the kitchen, removed all the tile from the bathroom walls and replaced it with drywall, expanded and tiled the shower (with two corner shelves), added a recessed light in the shower, installed a frame-less glass shower door, replaced the toilet, and hung a hickory floating shelf above the toilet. We also removed the massive light fixture from above the vanity and replaced it with a simple light fixture. We love how clean and simple this bathroom turned out, and how well it coordinates with their new kitchen. Angie and Erin were such a pleasure to work with. They have two young kids and were living in their home throughout the remodel, but they stayed patient and flexible with us throughout the process. We are thankful they trusted us with both of these projects, and are so glad that they love their new kitchen and bathroom! Our client, Shelley, contacted us for a kitchen remodel. She wanted to relocate her washer, dryer, and water heater, get rid of the large fluorescent light fixture, redo her cabinets, counters, and back splash, and open up the current archways on either side of her kitchen. We kept the sink in it’s original location, but relocated the dishwasher, refrigerator, and range for better functionality. Shelley requested hickory custom cabinets to fit her rustic, country style decor, and we love how her whole vision came together! Our standard set of custom kitchen cabinets always includes one full drawer bank (you’ll see Shelley’s to the left of her range), one trash can pull out (hers is to the left of her sink), full extension drawer glides, and pre-finished White Birch plywood for the interiors of the boxes. That means, you aren’t spending extra money to paint or clear coat the interior of your cabinets, and they will be able to handle wear and tear. We also offer extra options, such as floating shelves, wine racks, custom pull-outs, or extra drawer banks. For the most part, if you can dream it up, we can build it! We can construct the cabinet faces, door fronts, and drawer fronts using paint grade or stain/glaze grade woods. When using a hardwood (such as the hickory we used in this remodel) with such a distinct grain flow and beautiful knots, we can apply several coats of clear Oil based Polyurethane in lieu of a stain. This will bring out the natural beauty of the wood without changing the color. We love the warmth and detail the hickory grain brings to her kitchen. We were able to relocate her water heater, washer and dryer to the garage. This made room for a custom wine bar with floating shelves and a new spacious pantry with a sliding barn door. Shelley wanted to avoid installing electrical outlets in her back splash: she preferred the seamless look. Instead, we installed under cabinet outlets, which can be seen in some of the photos later in the post. A light granite counter and simple gray subway tile back splash were the perfect choices to brighten up this kitchen. We love the end result! Below are some before and after photos of the renovation. You can see the old archways that we opened up and squared off. The dark appliance through the hallway behind the kitchen is the original location of the washer, dryer, and water heater. 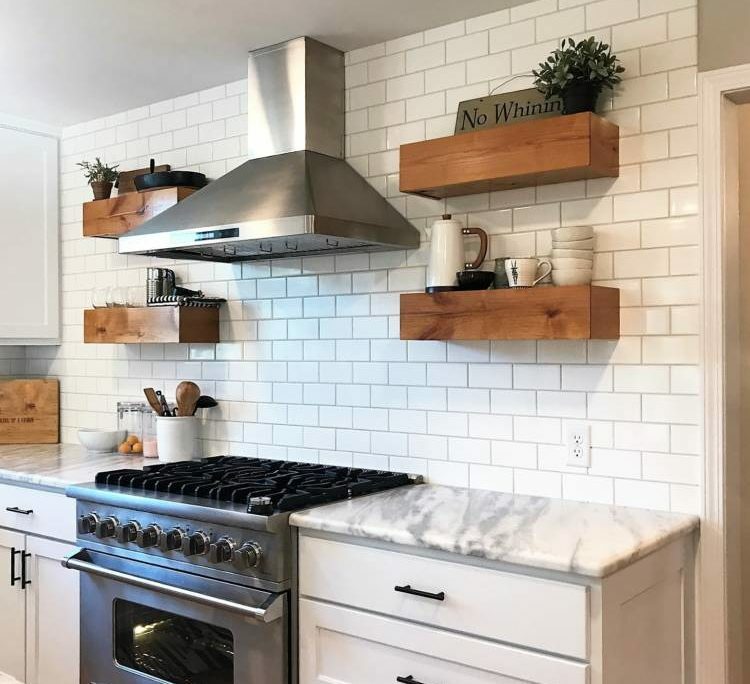 Floating shelves are a frequent request in our kitchen remodels. The shelves we build are hollow, allowing them to be lighter weight and installed more securely. For Shelley’s floating shelves, we used one piece of hickory and cut it so that the grain continued around the corner of the shelf, giving it the appearance that it is one solid piece of wood. A view from the opposite side of the kitchen. We installed adjustable french cleat shelving in the pantry. These shelves can be rearranged in many different configurations without the need for a drill or hardware: they easily hook on and off the wall cleats. Shelley chose a copper farmhouse sink, and we love the way it goes with the hickory and granite counter. A view of the sink, as well as the under cabinet plug strips. The large open space on the left in the picture below originally housed the refrigerator. We moved it to the right side where we were opening up the wall, to allow space for the refrigerator doors to open wide. We then relocated the range to allow for counter space on either side. Since we were already building new custom cabinets, we increased the height of them for maximum storage. A close up look at our cabinetry and the under cabinet plug strips. It was such a pleasure to work with Shelley. We are so thankful for her keen eye for design, and for trusting us with her kitchen remodel! We recently completed a large job for our clients, Zach & Carisse. They own a beautiful 1930’s home in College Station that has been in their family for decades, so they know it will be their forever home. They decided to remodel almost the entire first floor to fit their growing family’s needs so they could continue to enjoy their home for years to come. Below are brief “before and after” sketches of the layout changes that were made to the first floor. We converted the original garage into a new living room, and opened it up to the kitchen. We expanded the bathroom into part of the original garage to make space for a second bathroom entrance and larger vanity. We expanded the kitchen pantry by relocating the bedroom closet behind it. We moved the water heater in the garage to an exterior tank-less one. We created a new laundry / mud room out of part of the back porch, moving the washer and dyer out of the garage. We used part of the back porch for the newly relocated bedroom closet. To start, we needed to raise the floor in the existing garage so it would be level with the rest of the house to create the new living space. They eventually plan to build a new front porch extending almost the entire length of the house. In the mean time, to stay within budget and up to building code, we constructed a simple front porch at the new entrance. We took apart the back side of the garage to replace the old siding, add two new windows, and install French doors leading out to the back yard. Below is a view from the inside of the garage. The door pictured here leads into the old kitchen. The back corner of the original garage: the door pictured below leads to the back yard. New sub floor is being laid, and the framework has been done for the new windows and French doors. We opened up the load-bearing wall between the original garage and kitchen. We wrapped the exposed beams in knotty alder, hung a sleek black ceiling fan from the center, and installed recessed lighting. Two new windows and a new front door were also added to the front side of the original garage to create a new front entrance to their home. Below is a view from the dining room, through the kitchen, into the original garage. The same view is pictured below after the remodel was complete. The doorway down the hall on the left wall leads to the bathroom, which we expanded and created this second entrance to. A view of the new bathroom entrance, so guests can avoid walking through the bedroom to use the bathroom. Below is a view from the bedroom, through the bathroom, and into the new living space. We completely remodeled the bathroom. We expanded the bathroom to make room for a larger vanity and second entrance. Zach and Carisse chose a vintage floor tile to keep with the style and age of their home. They chose to remove the extra small bath tub to create a walk-in shower with recessed soap nook and built in corner bench. We built a custom vanity to match the kitchen cabinets, installed a new granite counter top, and finished it off with subway tile and bronze fixtures and hardware. For the kitchen remodel, we kept the sink, range, and vent hood in the same places. The refrigerator was relocated to the front wall, dishwasher was relocated next to the sink, and a custom island was constructed for the center. Zach & Carisse chose a beautiful gray granite counter with bronze fixtures and black hardware. We built two floating shelves on either side of the vent hood for decorative storage. Within the island, we built a microwave nook and custom storage, including a trash can drawer and a book shelf end cap. We expanded the old pantry by removing the bedroom closet that was behind it. Zach & Carisse had reclaimed this door and had been storing it for the perfect opportunity; we hung it as a barn door. It is both beautiful and functional since the pantry opens up to the main walk way between the dining room, kitchen, and living room. We hung French cleat shelving which can be easily moved around to fit various storage needs. We created a new laundry / mud room out of part of their existing back porch. We created a place for a second fridge and mud sink in this space, as well. French doors were installed leading from the dining room into the laundry room where the pair of windows are below. The remaining porch space on the back side of the new laundry room, through the door pictured below, became the new bedroom closet. Zach and Carisse have a great eye for design and are a pleasure to work with. We are so thankful that they trusted us with their forever home. We know they will enjoy it for years and years to come. Peter & Crystal hired us to help them update their kitchen. They were on a tight budget, and were looking to give their kitchen a much needed face lift. We adjusted their wish list & design to keep costs low where we could, while still giving them a kitchen they love. In a typical kitchen remodel, high-end, semi-custom to full-custom cabinetry can account for as much as 30%-40% of the total renovation budget. Simply redoing the doors & drawer fronts on this job saved thousands of dollars. We created a few custom cabinet pieces: a small one to fit between the dishwasher and relocated fridge, and a larger one with pull-out drawers to replace the cabinets where the peninsula once was. We kept their existing appliances and the general footprint of their kitchen by just opening up one wall. We didn’t need to relocate any plumbing or electric (with the exception of a small water line running to the fridge) which also saved a significant amount of money. We painted the existing cabinets, installed new granite counters & tile flooring, and kept the backsplash clean & simple with subway tile. We removed the fluorescent lights & installed recessed lighting. We also saved a substantial amount of their budget by opting for a pre-made roll-away island, as opposed to a built-in custom island. Peter & Crystal were such a pleasure to work with, and we love the end result! Our client, Carolyn, approached us about a kitchen & laundry room remodel. She opted to keep the same kitchen footprint and reuse her appliances to keep costs down. We converted their current laundry room into a mud room, and took part of their storage space in the garage for the new laundry room. They now have a much more functional, updated space. We took down the wall behind the washer & dryer to reveal a storage nook in the garage. We enclosed that nook to create the new laundry & pantry area. We raised the floor (since the garage floor was slightly lower than the house,) and moved the plumbing & electric for the washer & dryer. In the picture below, you can see that new converted mud room & laundry room through the doorway. The picture below is the view from inside the kitchen, looking through the mud room, into the new laundry room. We built the pantry on the right and made space for the washer & dryer on the left. We kept the same vinyl tile throughout to give a seamless look through to the laundry room. Below is a view of the mud room from the outside. We built, painted & installed new custom cabinets, laid vinyl tile flooring, installed granite countertops, a farm sink, and finished it off with brushed nickel hardware & fixtures. We really enjoyed working with Carolyn. She had a great vision for the design of her kitchen and for reworking her laundry space. We love the finished product! Our client, Andrew, and his business partners, own a rental property. They had previously converted half of the garage into a bedroom, but it was very outdated, and not located near a bathroom. They first hired us to update the bedroom: we enlarged the closet, replaced the wood paneling & ceiling with drywall, installed new windows & exterior siding, painted, and replaced the carpet. A few months later, they had us back to create an on-suite bathroom. The bedroom was currently located next to the laundry room, so we renovated that space to include a bathroom. This kept plumbing costs down and created a much more functional space. We first created a designated space for the washer & dryer, and gave the water heater it’s own designated closet. We raised the floor under the shower to allow for plumbing drainage. 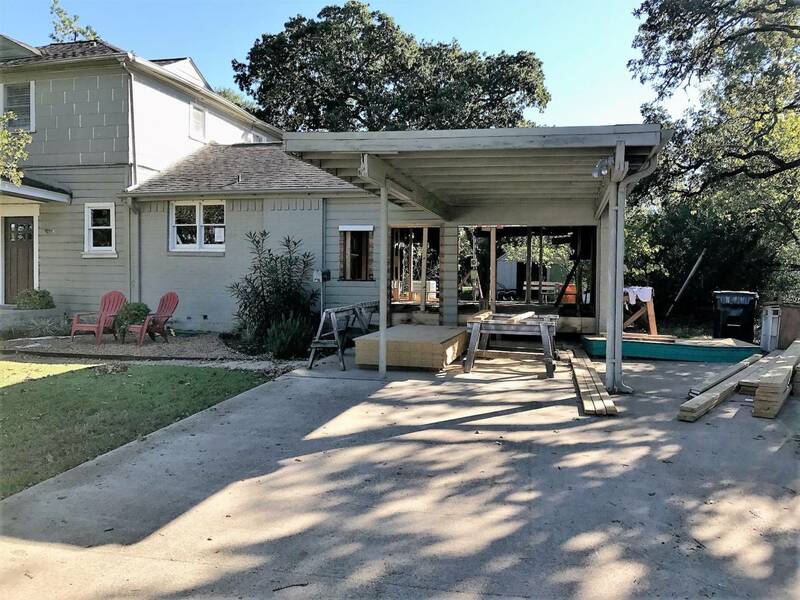 Our client opted for this option since digging into the concrete foundation is significantly more expensive, and since this is a rental property, keeping overhead costs down was important. We installed a sleek, curved shower stall, and a new vanity with a granite counter top. We installed a macerator system for the toilet, and a linen closet (with electric water heater access). A macerating toilet pumps the waste water up to the top of the waste line with an electric pump, as opposed to letting gravity pull the waste water through the line. It is then tied into the waste line of the other existing bathroom. This is a great solution for bathroom additions as it avoids having to dig through the foundation to create a downward sloping waste line. This was another way we helped our clients keep overhead costs low so they could earn maximum return on their investment. Andrew & his business partners now have a beautifully updated 4 bedroom, 2 bathroom house that immediately earns them more rental income each month and adds total value to their home. We recently completed a bathroom renovation for some wonderful clients, James and Becky. Their master bathroom had an elevated shower which they were hoping to remove. Unfortunately, due to the nature of the original construction of the shower, we were unable to lower it to ground level without extensive foundation work, so we gave it a complete update instead. We widened the steps in and out of the shower for safety, expanded the length and width of the shower, removed the shower doors, and updated all of the tile and fixtures. We installed travertine tile throughout the shower walls and tub surround, with an mosaic arabesque tile used as accents around the shower head and inset shelves. A fixed shower head and separate body sprayer were installed. Custom door fronts were made for the front of the tub surround to match the doors on their existing vanity. Their vanity area had been recently updated, so we left that alone, and simply replaced the floor tile throughout with a wood-grain tile. Becky chose a rectangular soaker tub to replace their existing tub. This allowed us to make room for the shower expansion. We love the three different tiles and fixtures Becky chose, and how they bring together the unique elements of this bathroom. It was such a pleasure working with James and Becky! Our client, Jim, had a rental property with water damage. They had to gut the entire kitchen and both bathrooms, and we were contacted to lead the remodels. We built custom cabinets for the kitchen and installed granite counters, arabesque tile backsplash, floating shelves, and new appliances. We also had the entire exterior of the home painted and installed new carpet in the bedrooms, and refinished the hardwood floors in the living spaces. We removed the cabinet and accordion doors over the peninsula to open up the kitchen to the main living room. We installed new custom vanities, linen storage, and granite counters to match the kitchen. Subway tile surround was installed in both showers. Our client, Justin, had an outdated and very tight bathroom. To the right of this shower stall was a narrow linen closet which was removed to make room for a much larger shower. We installed custom maple floating shelves and towel racks above the new toilet. The existing vanity and built-in storage unit was repainted and we replaced the top with a leather finished black granite counter. We love the way Justin’s tile choices came together: a gray wood-look tile for the floor, subway tile surround in the shower, and a small hexagon shower floor tile. In order to help out a friend financially, Justin decided to save some money on the remodel. He did much of the demo and painting himself, and did an excellent job. He is a great guy and we are thankful for the opportunity to work with him!